OK, so remember how I told you earlier this week that I was going to share the most epic use for leftover pulled pork? Well, folks, here it is. Hopefully I didn’t oversell it. I think it’s hard to oversell nachos. Especially these. 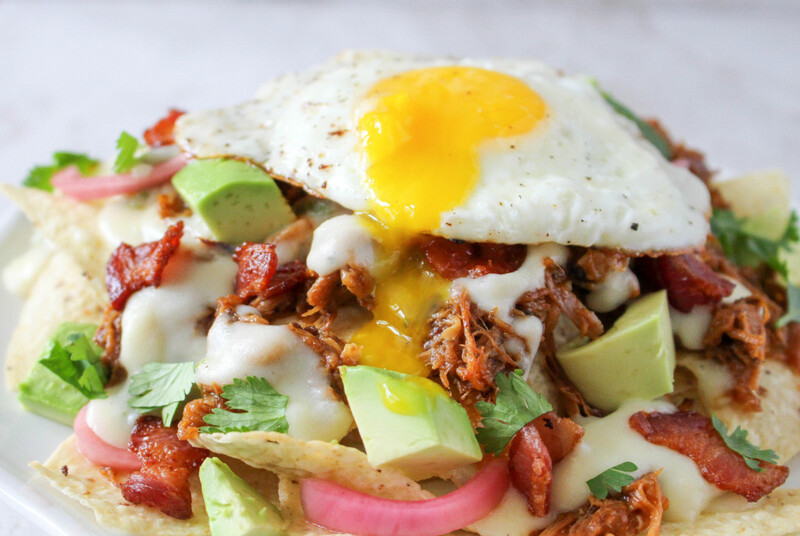 Luscious pulled pork covers a bed of crispy tortilla chips and is topped with bacon, avocados, those pickled red onions I went on and on about last time, runny-yolked eggs (holla! ), and a heavenly spicy cheese sauce…um, yes. EPIC is definitely the right word. 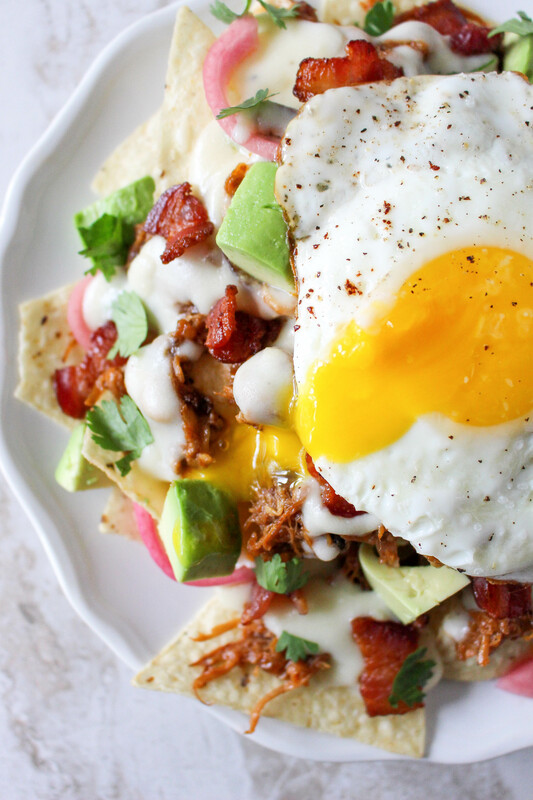 These could be eaten for breakfast, brunch, lunch, dinner, or as a fun snack. I’m down with eggs as snacks. Let’s make it a thing. 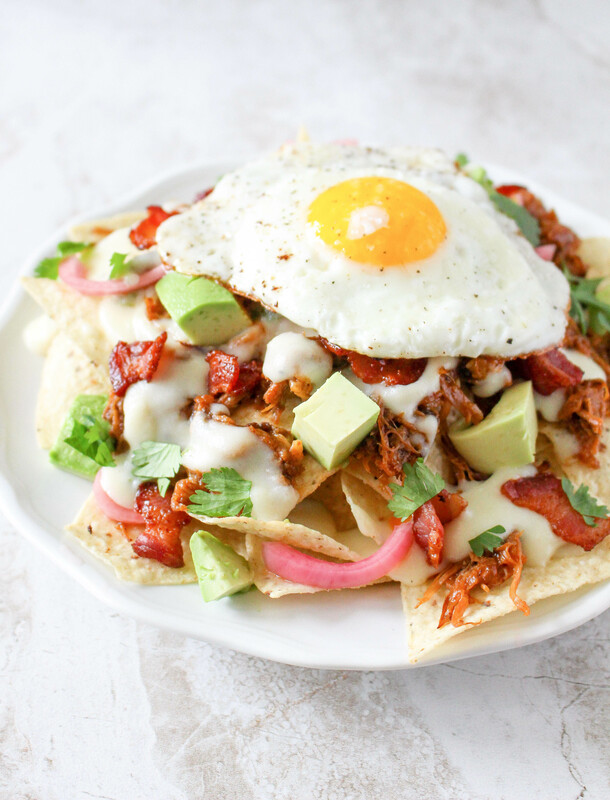 Or nachos for breakfast? Yes, that definitely needs to be a thing. This idea first came to me when I was presented with cups upon cups of leftover pulled pork. We had had our fill of sandwiches within a day or two of first making them. I didn’t want to freeze the pork because it was too good to save for later. 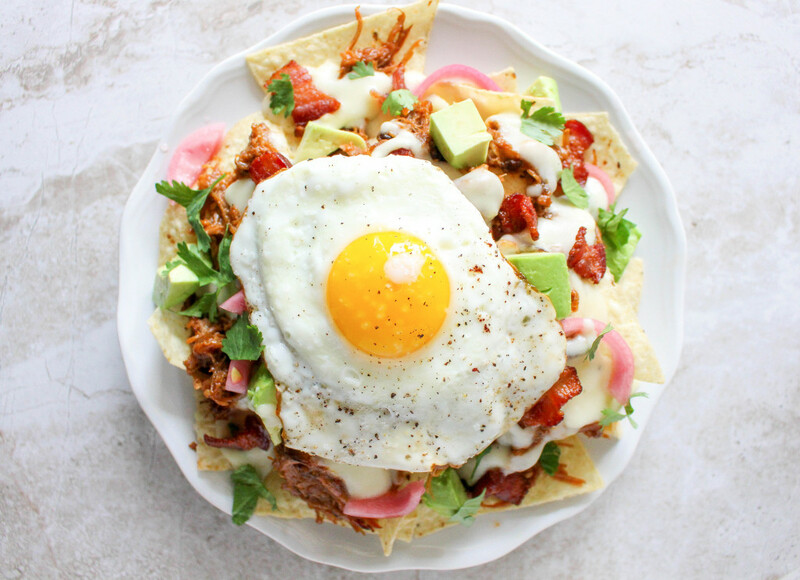 I ALMOST made enchiladas with them for Cinco de Mayo (which would have been equally as fab, I think) but made these nachos instead. I knew I wanted the pork to be combined with something breakfast-y. That means eggs in my world. And bacon…because one type of pork just isn’t enough. You can never have enough pork. Plus tons of freshness from avocados and cilantro and lime wedges. And to tie it all together? CHEESE. Of course. This cheese sauce is so simple yet so good. It’s creamy and sharp at the same time and harbors the awesome flavor and spice of jalapeño peppers. I like to drizzle it over everything before the nachos go in the oven to warm up, and then AGAIN when they come out piping hot. That way, you’re guaranteed to have super melty, gooey cheese. Which goes swimmingly with gooey egg yolk. Just sayin’. My sister was helping me with the baby on the afternoon I decided to make these. While he took a nap, we devoured most of what is shown in these pictures. It was glorious. Gluttonous but glorious. 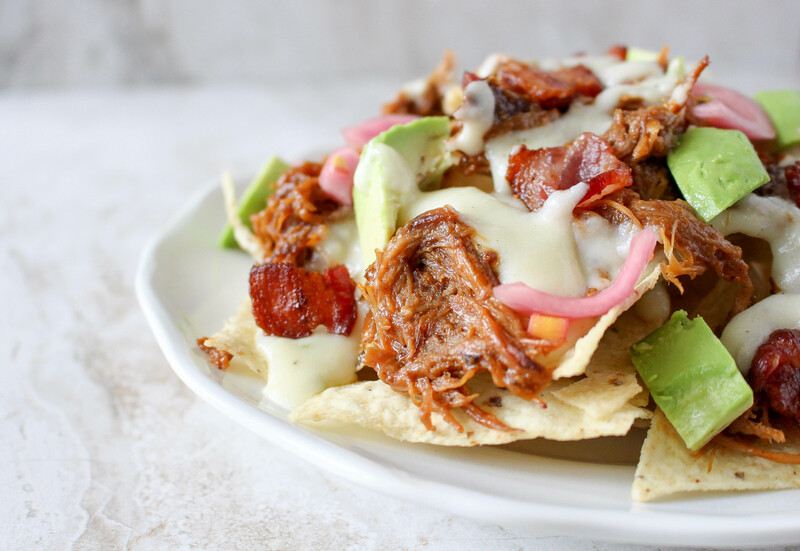 Which is exactly how eating nachos should be. Melt the butter in a small pot and then add the jalapeño. Cook for a minute and then add the flour, stirring until mixed in well. Cook for another minute and then slowly whisk in the milk. Cook, stirring frequently, until the mixture thickens and coats the back of a spoon. Add in the cheeses and stir until melted. Season, to taste, with salt and pepper. Keep warm. Preheat the oven to 350°F and line a baking sheet with parchment paper. 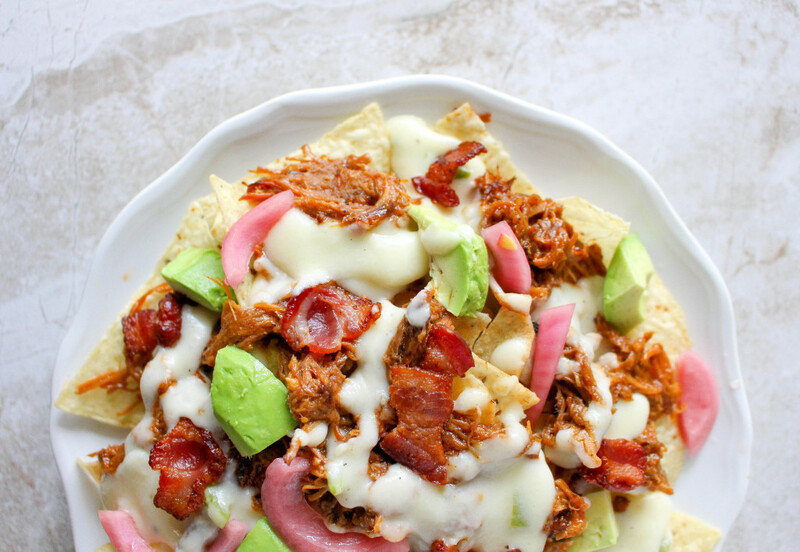 Spread the tortilla chips out in an even layer on the parchment and then layer the pulled pork, bacon bits, jalapeños, and pickled red onions on top. Drizzle the assembled nachos with roughly half of the cheese sauce and then put in the oven for about 10 minutes, just to warm everything through. 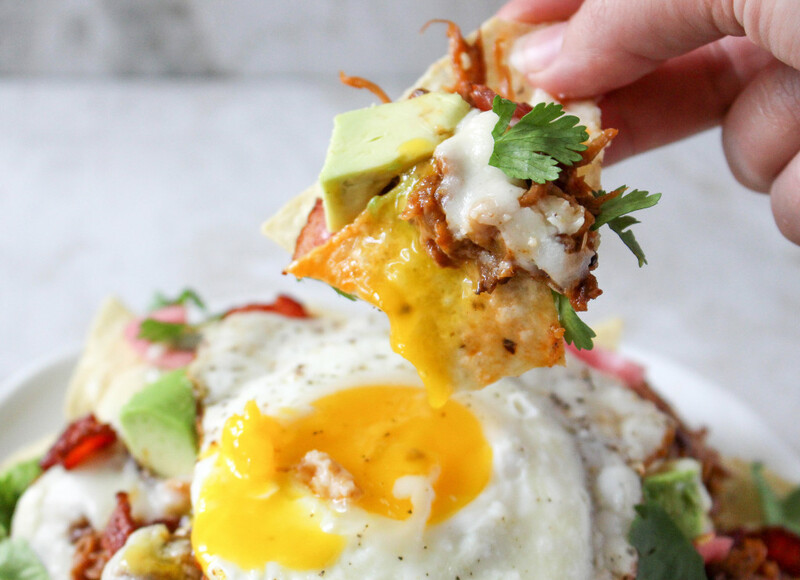 While the nachos are baking, fry your eggs to desired doneness and prep your fresh toppings (avocado, cilantro, and limes). 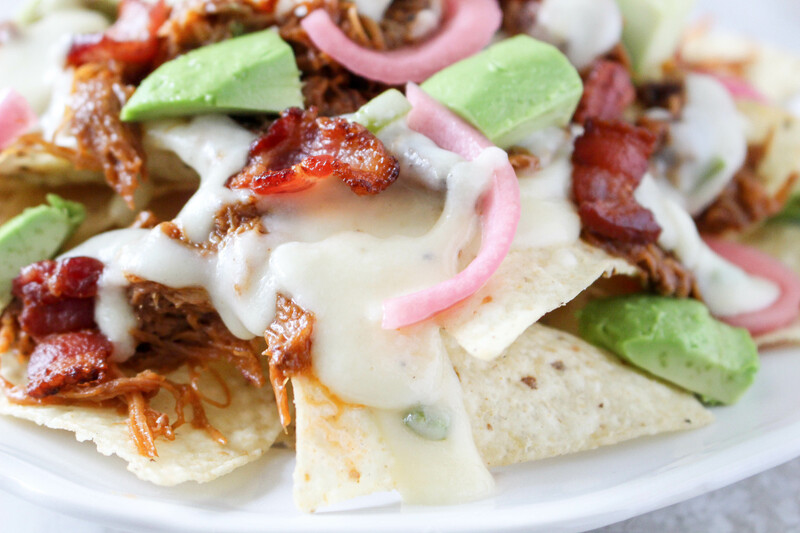 Take the nachos out of the oven and drizzle with additional warm cheese sauce. Top with the eggs, avocado, and chopped cilantro. Serve immediately with lime wedges and additional cheese sauce on the side. 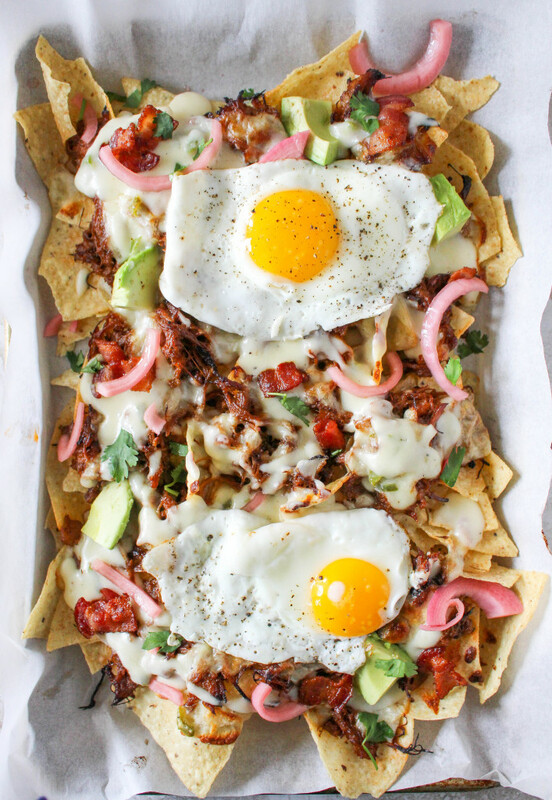 OMG I would this breakfast for lunch, dinner and breakfast, it looks perfect! This looks like the best thing ever! Two kinds of pork is perfect and I love the green and pink from the avocado and pickled onions. Yummy! I am feeling these for a night with friends! Thank you so much!! This was SO good! I didn’t have any pulled pork though, so I used some cut up pastrami and it works pretty well. I’ll definitely have to share this with others, thank you!